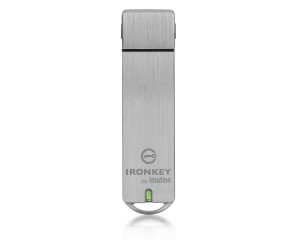 The IronKey flash drives are one of the world’s most secure USB flash drives. The IronKey devices are very easy and simple to use. With the IronKey enterprise s250 and D250 you can elemnate the risk of data loss or flash drivs and increase security by using the latest hardware-encrypted device in the world. The IronKey does not need any software or driveres installed before it can be working, you simply connect your IronKey device to the computer and it will automatically run and route you to the embedded password authorization capability. The IronKey is a scalable platform for deploying cutting edge secure enterprise applications. The device is on a constant data encryption state, it cannot be shut off or disabled, it is encrypted with military-grade hardware encryption. Unlike software encryption, which the encryption can easily be disabled. It has a special self destructive feature which makes it impossible for the device to be hacked into. The feature works like this, after a predetermined number of falied log in attempts, the device will immediatley lock itself and the cyrptochip will remove the encrypted data with Flash Trash Technology. The IronKey Enterprise device can also be managed remotley and securely as it contains the public-key encryption capability. To learn more about The IronKey Enterprise, please visit our IronKey Enterprise Section on our website. You can also read this product review by cyprotect.com in which they provide a detailed analysis of our product and its services.